Dr Ing. Marc Anthony Azzopardi’s relationship with electrical engineering traces back to early childhood with over 20 years experience in electronics. He wrote his first GWBasic software programs at age 4 on a Zilog Z80 Sinclair Spectrum, constructed his first oscillators at age 8, blew-up his parents’ washroom-turned-laboratory at age 10 and started formal training in electronics at the Fellenberg Training Centre, aged 13. 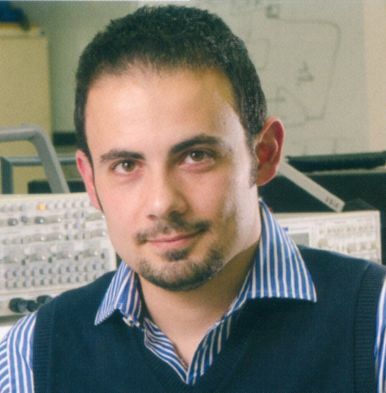 Dr Azzopardi went on to graduate with an Honours degree in Electrical Engineering from the University of Malta (UoM) in 2002, majoring in Control, VLSI and Communications. For his final year project, Dr Azzopardi obtained a distinction for pioneering the use of modern FPGAs and reconfigurable computing at UoM. Using Virtex FPGAs he developed a family of Viterbi Decoders and multimillion-gate COFDM and TCM modules for software radio applications. Following an internship as product engineer for automotive devices with STMicroelectronics, he rejoined UoM to embark on a research career. He has been with the Department of Electronic Systems Engineering ever since, carrying out applied research. Through collaboration with STMicroelectronics (Catania), he developed low voltage analogue 180nm CMOS circuits for use in CATV. Dr Azzopardi maintains an active interest in biomedical electronics. Previous work involved Fast Cyclicvoltammetry for neurotransmitter discrimination in living tissue. Dr Azzopardi was involved in the development of driver/pilot head localization hardware for use in the automotive/aerospace sectors, for point of gaze and eye-blink/saccade measurement. A high performance camera synchronization technique was developed for which Dr Azzopardi holds an international patent and is currently actively seeking commercialization. A scholarship took Dr Azzopardi’s research career to the UK where he obtained his Ph.D. in aeronautics from Cranfield University. He specialized in Intelligent Transport Systems and Computational Air Traffic Management (CATM) based on Swarm Robotics. On his return in 2015, he refocused his interests to advanced electronics and set up the ASTREA research group to prepare for Malta’s first satellite space mission. During his free time Dr Azzopardi enjoys hacking nanodrones, scubadiving, photography, especially marine photography as well as trekking in the great outdoors. Intelligent Transportation Systems: Aerospace, Automotive, Marine. Cachia, D., Camilleri, J., Azzopardi, M.A., Angling, M., Sammut, A., 2016, “Feasibility Study of a PocketQube Satellite Platform to Host an Ionospheric Impedance Probe”, Proceedings of the 4S Symposium: Small Satellites go Viral,European Space Agency (ESA), Valletta, Malta, 30 May-3 Jun. Camilleri, J., Cachia, D., Angling, M., Azzopardi, M.A., Sammut, A. 2016, “A Miniaturized Impedance Probe for Ionospheric Sensing”, Proceedings of the 5th Interplanetary CubeSat workshop, iCubeSat 2016,University of Oxford, Oxford, UK, 24-25 May. Azzopardi, C.A., Azzopardi, M.A., Muscat, R. & Camilleri, K.P. 2012, “Investigating Linear Superposition of Multi-Species Neurotransmitter Voltammetric Measurements In-Vitro”, Proceeding of The 34th Annual International Conference of the Engineering in Medicine and Biology (EMBC2012),IEEE/EMBS, San Diego, California, USA, Aug 28 – Sep 1, pp. 1475. Azzopardi, M.A. & Whidborne, J.F. 2011, “Computational Air Traffic Management”, Proceedings of the 30th AIAA/IEEE Digital Avionics Systems Conference (DASC2011), Best Paper of Session,IEEE/AIAA, Seattle, WA, USA, Oct 16-20, pp. 1.B.5-1. Azzopardi, M.A. 2010, Method And Apparatus For Generating And Transmitting Synchronized Video Data, WO Patent WO/2010/029,040. Azzopardi, M.A., Grech, I. & Leconte, J. 2010, “High Speed Tri-Vision System For Automotive Applications”, European Transport Research Review Journal, Springer Verlag, Berlin/Heidelberg, vol. 2, no. 1, pp. 31-51. Sammut, A., Zammit, B., Azzopardi, M.A., Zammit-Mangion, D. & Szasz, S. 2010, “Design and Pilot Evaluation of a Runway Conflict Detecting and Alerting System “, Proceedings of the AIAA Guidance, Navigation, and Control Conference, (GN&C2010),American Institute of Aeronautics and Astronautics (AIAA), Toronto, Ontario, Canada, Aug. 2-5. Azzopardi, M.A. 2009, “Towards Camera-Link as an Automotive Video Bus: Enabling High Speed, Synchronised, Multivision Systems for Automotive Applications”, Proceedings of The BMVA Symposium on Vision for Automotive Applications,British Machine Vision Association (BMVA), London, UK, May 20th. Azzopardi, M.A. 2008, “Camera-Link and Synchronism in Automotive Multi-Vision Systems”, Proceedings of the 4th International Conference on Automotive Technologies (ICAT2008),ICAT, Istanbul, Turkey, Nov 13-14, pp. 344.